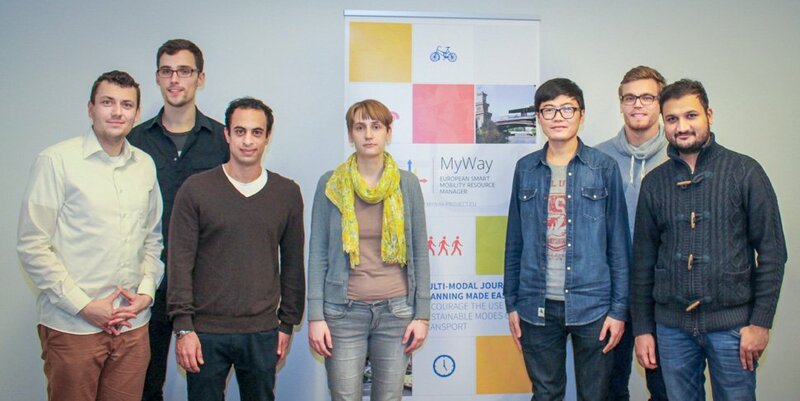 As part of the European research project MyWay Fraunhofer FOKUS develops a smartphone app for multi-modal trip planning. From October to December 2015 a first test phase was carried out. The six most-active users received a prize in Berlin today. The European research project MyWay develops a smartphone app with the objective to place the traveler at the heart of modern mobility. To optimize the app to the travel requirements of potential users, a test phase was carried out in Barcelona (ES), Berlin (DE) and Trikala (GR) between October 1st and December 31st 2015. In total, the app was downloaded 866 times. 362 users signed up for the trial and conducted 8613 queries – 1691 in Berlin. Prizes, such as an action cam or four USB-chargers, incentivized potential users to participate. Today, in the Daimler Center for Automotive Information Technology Innovations (DCAITI) at the TU Berlin, participants received their prizes. The purpose is to holistically address the efficient and seamless integration and use of complementary, capacity-limited mobility services in the overall urban travel chain, including all transport modes (motorised and non-motorised, EVs, public transport, flexible services such as transport on-demand) and mobility sharing schemes (e.g. car sharing, motorbike sharing and carpooling). The platform has been tested in three Living Lab demonstrations in Barcelona and Catalonia Region, Berlin, and Trikala involving local users and stakeholders. This approach gives priority to the egocentric vision of the user, finding the right compromise for each single traveler and offering a solution closest to their personal needs and preferences, making the frequent use of it (as an alternative to an ideal but not always practical solution) a main contribution to the sustainability of urban transport.